Habit: Perennial herb, +- green. Stem: decumbent to erect, generally 1--several from generally short caudex. Leaf: alternate, generally +- basal, generally < inflorescence, toothed or generally > 7-lobed, generally reduced distally on stem; petiole generally < blade. Inflorescence: raceme, spike-like; bracts (at least proximal) generally +- like distal leaves; pedicels 1--6 mm. Flower: calyx lobes (2,4)5, distal-most generally shortest (all generally < tube), lateral fused in pairs; corolla white or yellow to red or purple, upper lip hood- or beak-like, curved or not, lower lip 3-lobed, narrow to fan-shaped, central lobe generally smallest; fertile stamens 4, generally glabrous, anthers generally included, sacs 2 per stamen, equal; stigma head-like, generally exserted. Fruit: generally +- ovate or lanceolate in outline, asymmetric, opening mostly on upper side. Seed: smooth or netted. Stem: mostly underground, 3--20 cm, sparsely tomentose; caudex long. Leaf: basal 5--22 cm, generally > inflorescence, +- lanceolate, segments 11--25, lanceolate to ovate, toothed to lobed, present at flower. Inflorescence: 3--12 cm; bracts hairy, proximal >> flowers. 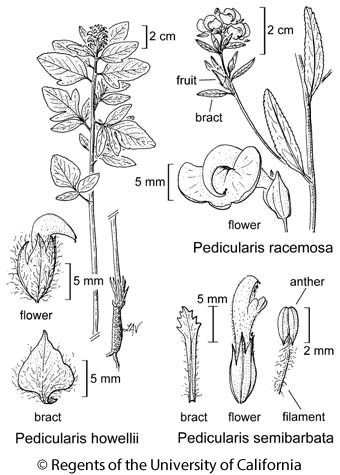 Flower: calyx 8--10 mm, ciliate; corolla 15--24 mm, +- club-like, +- yellow, generally tinged red or tipped purple, hairy, upper lip 7--10 mm, hooded, lower lip 5--7 mm, lobes +- equal, rounded; anthers 2--2.5 mm, exserted, base acuminate, filaments hairy. Fruit: 6.5--10 mm. Seed: 3.5--4.5 mm, smooth. Citation for this treatment: Linda Ann Vorobik 2012, Pedicularis semibarbata, in Jepson Flora Project (eds.) Jepson eFlora, http://ucjeps.berkeley.edu/eflora/eflora_display.php?tid=36608, accessed on April 20, 2019. NCoRH, CaRH, SN, TR, PR; Markers link to CCH specimen records. Yellow markers indicate records that may provide evidence for eFlora range revision or may have georeferencing or identification issues. Purple markers indicate specimens collected from a garden, greenhouse, or other non-wild location.